Driving upstate from NYC on a Friday night for a weekend of leisure in the Hudson Valley? Good move. Your energy level dials down to “mellow” as you approach Exit 19. The last thing on your mind is sitting in a busy restaurant, or worse yet - having to cook dinner. Well, let me introduce you to Eat Drink 28. Named after Route 28, the main artery that runs from East to West uniting Kingston with Woodstock, Olive, Phoenicia, Shandaken and beyond, is a small shopping plaza that happens to offer some of the best food dishes and ingredients available in the Hudson Valley. 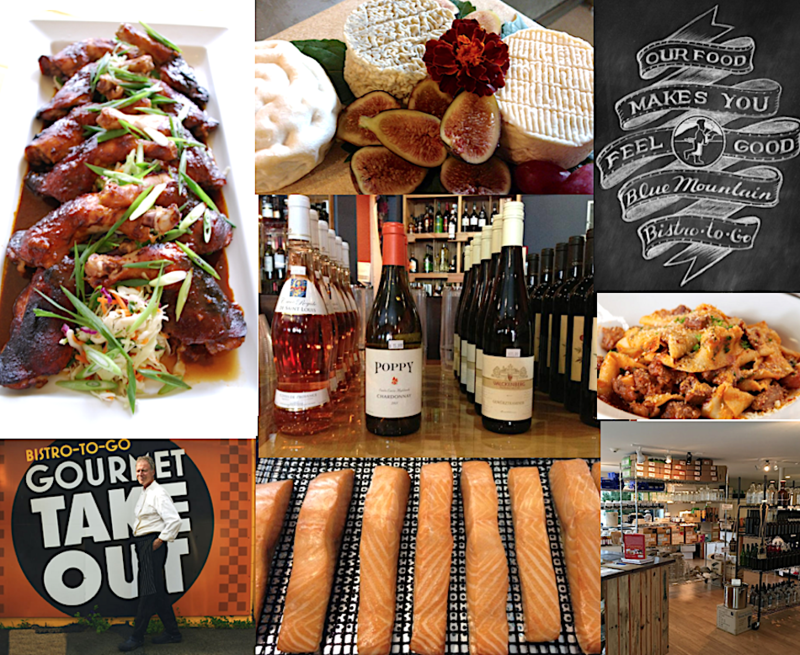 Dubbed “Eat Drink 28 Gourmet Row”, the shops in this plaza offer a variety of foods and drink —including smoked salmon, fresh pasta, wine, gourmet take-out, and kombucha all in one location. The perfect stop if all you want to do is hole up for the weekend. Blue Mountain Bistro-To-Go: Since its origin in the Woodstock community as a restaurant and catering company, Blue Mountain Bistro-to-Go has been the provider of memorable meals for local weddings, anniversaries, special occasions as well as intimate dinners. Bistro-to-Go has a take out counter and a small cafe with a few tables. The venue offers a wide range of gourmet meals, sandwiches, soup, salads and daily specials – all created from locally sourced ingredients. And, let’s not forget to mention the bakery filled with an array of home-baked desserts, cookies, pies and cakes. Blue Mountain Bistro-to-go even features a line of frozen meals available to be enjoyed anytime. The Wine Hutch: The Wine Hutch has a huge selection of the finest wines and spirits available as well as plenty of local, organic and biodynamic options. Be sure to stop by every Friday between 4:30-7:30 PM for their free wine tastings; a popular event to sample the latest wine arrivals and to meet and chat with local wine lovers. Hookline Fish Co: Unlike the East Coast tradition of cold-preserved Lox and Nova, Hookline Fish Co. offers Hot Smoked Salmon in the tradition of the Pacific Northwest using sustainable fish direct from the Faroe Islands. Apart from the smoked salmon, Hookline sells smoked salmon paté, chowder and quiche. Smoked salmon from Hookline Fish Co. are available at other shops on the “Eat Drink 28” plaza and used as ingredients in special restaurants in the area. La Bella Pasta: For over 30 years La Bella Pasta, a family owned and operated pasta-making business, has been making custom Italian ravioli, gnocchi, tortellini, linguini, lasagne, and spaghetti using wholesome traditional ingredients. There are also homemade sauces to complement the pastas and everything is refrigerated and freezer-ready. KBBK Kombucha & Fermentation Supplies: Kombucha has recently emerged as a health-giving, delicious beverage. It’s essentially a fermented black or green tea made with yeast and it’s slightly effervescent. The health properties of Kombucha go back over 2000 years and is believed to help manage many ailments including arthritis and cancer, as well as being a delicious and refreshing drink. And, Kombucha is easy and fun to brew at home. KBBK sells all the equipment and supplies to home-brew your very own. Not to mention, a stop at their shop is educational and fun. So the next time you're traveling down Route 28, put on the brakes and visit “Eat Drink 28 Gourmet Row” to pick up homemade goods for breakfast, lunch or dinner. With the emergence of the “Eat Drink 28” group of shops, picking up ingredients for a cocktail party, a weekend of entertaining, a gift basket of treats, planning a catered event, or just grabbing an intimate dinner for two to heat up at home has never been easier!